Like to make your refrigeration or air conditioning business more profitable in 2014? It’s a brand new year but whilst market reports are telling us that the ACR / HVAC industry is on the steady growth path until 2018, down on the shop floor many companies are feeling the pressure of day to day finances. If however you are faced with expansion and growth then that to can be a headache if your internal processes are not geared to deal with it. Mobile field service software is one area of improvement that can realise rapid cost reduction and improved efficiency almost overnight. Everyone seems to have a smart something! So why are you using paper and pen? Maybe it feels familiar and fail safe, but the truth is paper can no longer compete in an industry that is innovating so fast. Spending 10 minutes reading and copying a service sheet into you favourite trusty spreadsheet is no way to be going either. I couldn’t afford it.. could I? “Can you afford not to?” is probably a more suitable questions. However, software systems such as RedPoint F Gas Platform provide entry level access to scaleable cloud solutions for a matter of a few pounds by using your existing mobile devices. Download the App today for iPhone or iPad and experience the simplicity of enterprise facilities management. Remote HVAC monitoring is not a new thing. It’s been around a long time in one form or another. Often the relationship with a remote sensor if fairly uni directional and requires facilities mangers to interact with various systems to poll information or respond to critical information. Whilst this works well, there is a lot of room for improvement. The age of the self aware HVAC system is arriving…. 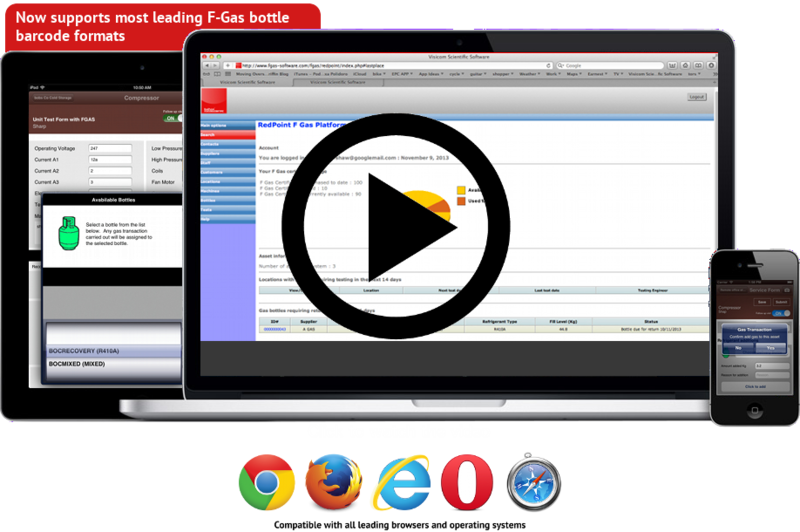 RedPoint F Gas Software Platform will soon be interfaced with the RedPoint Monitor and AI platforms to deliver perhaps the worlds most accessible if not first self aware HVAC management system. Working with Visicom Scientific Software RedPoint Monitor, RP F Gas will communicate directly with refrigerators and Air conditioning systems who can feed information on health and status as well as required service directly to a custom developed Artificial Intelligent controlled FM module within the RP F Gas Platform. Self learning profiles for each machine will be able to automatically decide if service is required and if authorised assign service personnel automatically direct to their FM app or mobile device. If the engineer needs to reschedule or reject a visit the refrigerator or Air conditioning machine itself will negotiate the arrangement with the asset owner and engineer team. Only if it cannot reach a satisfactory conclusion will it call to the powers above for further assistance.